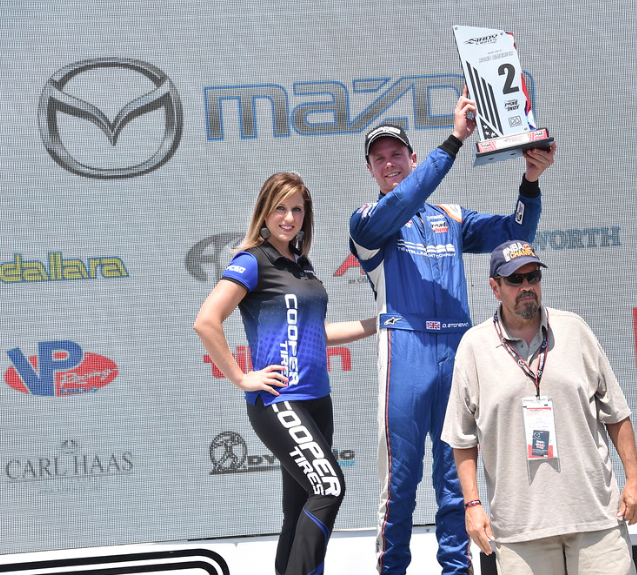 Indy Lights Presented by Cooper Tires, Road America, Elkhart Lake, Wisconsin, USA, 25th June 2016 Dean Stoneman reinforced his championship ambitions with an impressive 2nd place, in the first of two races this weekend. Stoneman, who won the Freedom 100 last month in Indianapolis with a famous victory, made it four podiums in as many races at the long sweeping 4.7 mile Wisconsin despite having suffered a five second penalty. Starting from 5th, Stoneman made a great start and as early as the first lap was up to 3rd. The racing was competitive and the Southampton driver had to battle hard to hold position through the steep curves of Road America, a circuit similar to the Belgium GP track Spa in so many ways. By lap three Stoneman was battling with his championship rival Ed Jones swapping position for second and the two pushed each other hard. On lap seven Stoneman was adjudged to have blocked the car behind him and was handed a five second penalty, meaning that the 25 year old had to finish at least five seconds ahead of the fourth placed car to secure another podium and with it vital championship points. But as the race went on Stoneman rose to the challenge and opened up the gap from the third placed car lap upon lap and finished the race over six seconds ahead and so bagging 2nd place despite a series of safety cars, yellow flags and aggressive driving from his nearest championship rivals. The result consolidates second place in the series standings and closes the gap to 22 points.